Just like you probably shouldn’t admit if you have a favorite in your family, I probably shouldn’t play favorites with my blog recipes. I can’t help it, though. 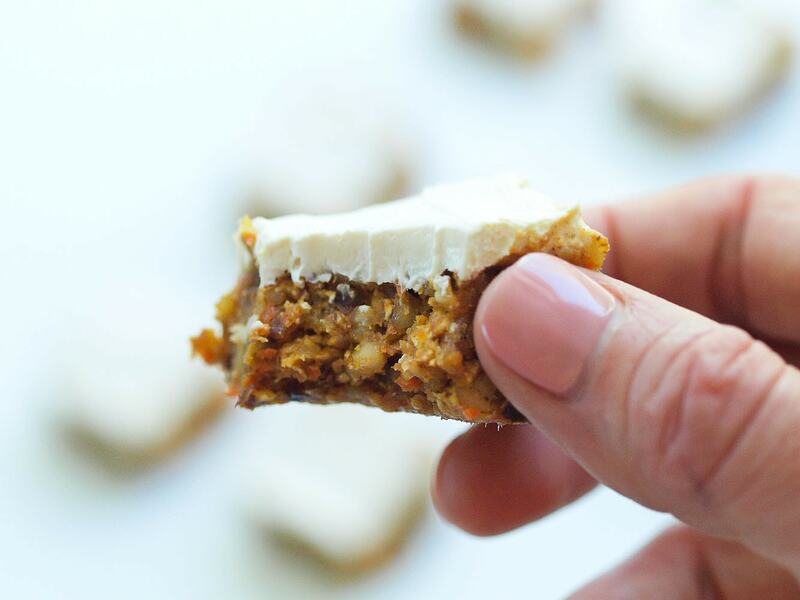 These healthy carrot cake bars have immediately made their way to the top of my favorites list. There’s so much to love about this healthy dessert/snack/breakfast. Yep, these are healthy enough to eat for breakfast or a snack. And we most certainly have. First, they are very low in sugar. The bars are sweetened with dates, raisins, and just a little maple syrup. They are gluten-free, too. I used some rolled oats, but no flour or wheat at all. The texture is perfect! They aren’t Larabar-ish, despite the dates and nuts used to create the bars. Because carrot cake isn’t carrot cake without a cream cheese frosting, I used real cream cheese for these. I wanted to ensure the frosting stayed nice and thick and I didn’t want to add anymore sugar, so I used liquid stevia drops to sweeten the frosting. It worked perfectly, but if you don’t have liquid stevia, you can use this recipe for cream cheese frosting sweetened with maple syrup. 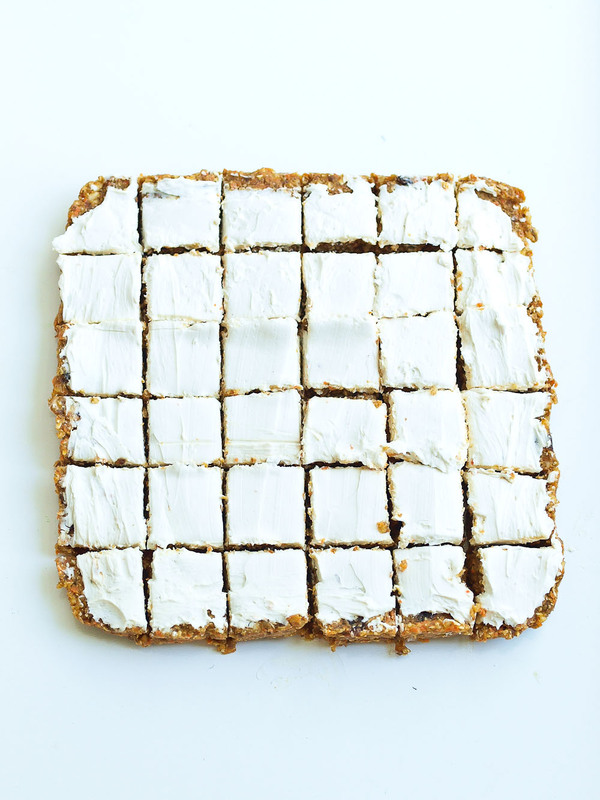 Last, these Healthy Carrot Cake Bars could not be any easier. I used my food processor for the whole thing. No other bowls needed. If you don’t have a food processor (get one!! ), you can chop everything by hand, but it’ll be a bit more work. And you don’t even need to turn on your oven. These Carrot Cake Bars are not baked! They can be ready in about 20 minutes, tops. I cut these into small bars for portion control in hopes that I’d be able to eat just one or two in a sitting. It didn’t work. 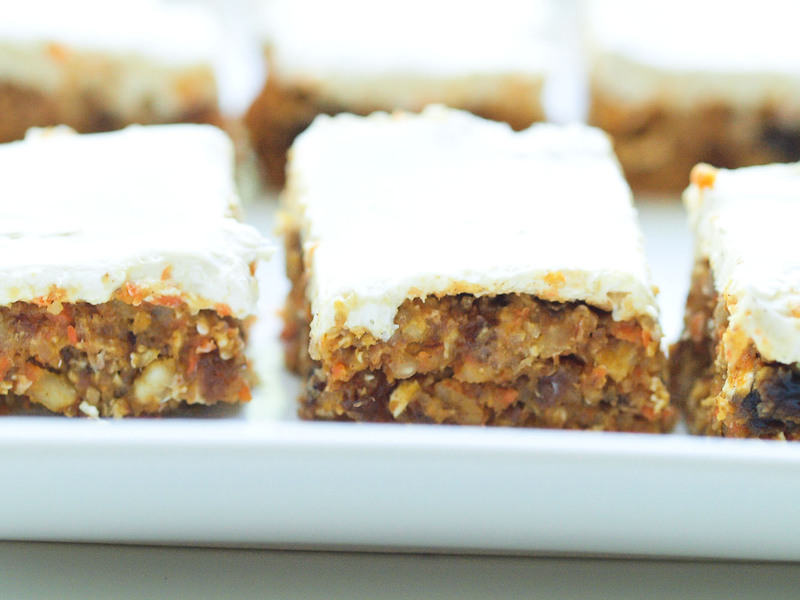 You are going to LOVE these healthy carrot cake bars! But be warned: they are addicting. You are going to LOVE these healthy carrot cake bars! But be warned: they are addicting. Line an 8X8 inch pan with parchment paper or lightly oiled tin foil. Press the carrot mixture into the pan. Put it in the freezer to help it set while you are making the frosting. Rinse out the food processor and put the S-blade back in. Add the cream cheese, vanilla, and stevia and process until it is just mixed. Don’t over process. Use a spatula to put the frosting on top of the carrot cake bars. Cut into the size you desire. These need to be stored in the fridge because there is no sugar in the cream cheese. Enjoy! This post was originally published in 2015. A video was added in 2019. Holy yum! I loooove carrot cake and I love this healthier version. I may need to try it this weekend. Oh my goodness! YUM! I have to try these. Wow!! These look amazing! We can’t do walnuts, but I wonder if maybe using all almonds would work? I need to give it a try! Yes, I think all almonds would work. Let me know if you give it a try! man oh man, i am pinning these. or rather, can you just come make them? please? How do you think these would work if frozen? Can you replace the dates with something else? im in love. I want to try this but my children are allergic to nuts. What to do? Oh, my heart hurts for you! If I were you, I’d substitute seeds for the nuts. It won’t be exactly the same, but I think it’ll work. I’d go for larger, sturdier seeds like sunflower seeds and pumpkin seeds (not chia or sesame). 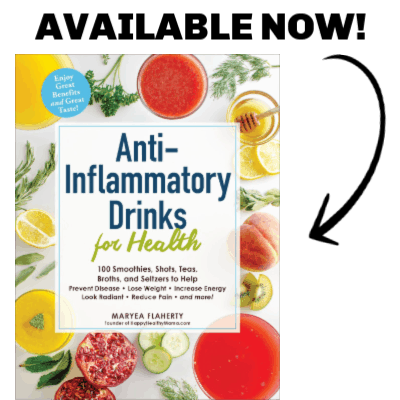 Please let me know if you try it and if it works! Thank you for this recipe. Would you say those bars would stay together well enough to be taken on hiking trips? Yes, I think so! I’m not sure how well the cream cheese will hold up, but I they are good without the frosting, as well! Yum. Thank you. I had a lot of leftover carrot sticks from a BBQ so this recipe was perfect. To make the bars more portable, increase the protein and therefore slow the carbs, I added some plain whey isolate and didn’t frost. Thanks again. How long do these bars last? These are amazingly delicious! I may have put a tad too much maple syrup in them, because they were a bit gooey. Carrot cake is my favourite and it’s nice to have a healthier alternative!! These look delicious. Do you have a suggestion for a grain free alternative to the oats? Wowzers! This is sinfully delicious, without any guilt. I decided not to sub the oats, but next time I think I’ll add some melted coconut oil to help it stick. I also omitted the stevia and the frosting is still perfect. This is definitely going into my recipe book. Thanks for the feedback, Jane! Thank you!!! I wanted to make a sugar-free dessert for my aunt’s birthday, so I tried your recipe. These bars were freaking amazing! They were perfect even without the cream cheese frosting. I am excited to try more of your recipes. Any ideas on what to sub for the oats to make these grain free? Can you sub stevia granular for the liquid? Thanks for this healthier carrot recipe. I love this version. I want to cook it this weekend.